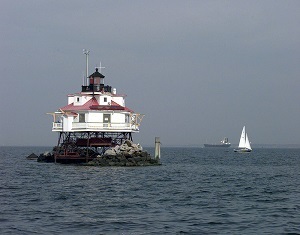 Chesapeake Bay is an estuary and the largest such body in the contiguous United States and is a very important feature for the ecology and economy of the Middle Atlantic Region. 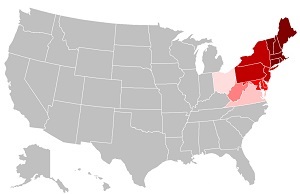 More than 150 major rivers and streams flow into the bay's 64,299-square-mile - 166,534 km2 covering parts of six states. History in 1524, Italian explorer Giovanni da Verrazzano sailed past the Chesapeake, but did not enter the bay. Spanish explorers may have been the first Europeans to explore parts of the bay which they named Bay of the Mother of God. In the late 16th century the British founded a colony and Captain John Smith explored and mapped it between 1607 and 1609. The first designated all-water National Historic Trail was created in 2006 following Smith's historic 17th century voyage. The Eastern Shore is home to crabbers, oystermen, gentlemen-farmers and sharecroppers, boat builders and antiques dealers. Activities include fishing, crabbing, swimming, boating, kayaking and sailing. 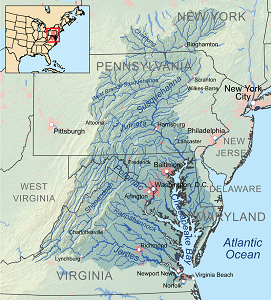 Geology and Hydrology the bay was formed starting about 10,000 years ago when rising sea levels at the end of the last ice age flooded the Susquehanna River valley. Much of the bay is shallow; it is approximately 200 miles - 320 km - long and 2.8 miles - 4.5 km - wide at its narrowest and 30 miles - 48 km - at its widest point. Average depth is 21 feet - 6.4 m. Because the bay is an estuary, it has fresh water, salt water and brackish water. Fishing once employed up to nine thousand watermen and their skipjacks, the only remaining sailing workboats in US waters, engaged in the seafood production of blue crabs, clams and oysters. Now, runoffs from farms and urban areas, over-harvesting and foreign species invasions have made the bay less productive. Oyster farming helps maintain the estuary's productivity and is a natural effort for filtering impurities and reduce the amount of nitrogen compounds entering Chesapeake Bay. 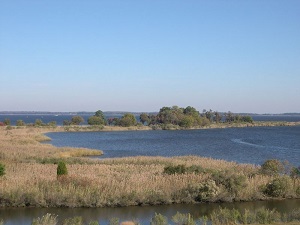 Environment in the 1970s, Chesapeake Bay was discovered to contain marine dead zones - waters depleted of oxygen and unable to support life – that weaken the base of the estuary and its food source. The runoff and pollution have many components that help contribute to the algal bloom which is mainly fed by phosphorus and nitrogen. This algae prevents sunlight from reaching the bottom of the bay while alive and deoxygenates the bay's water when it dies and rots. Also, the overharvesting of oysters has made it difficult for them to reproduce, which requires close proximity to one another. The depletion of oysters has had a particularly harmful effect on the quality of the bay as they serve as natural water filters, and their decline has further reduced the water quality of the bay.